This summer, American Music Theatre is proud to partner with Four Diamonds and Penn State Health Children’s Hospital to present our “Crooners Conquer Childhood Cancer” fundraising efforts. Back in 1969, Christopher Millard was 11 years old when he was first diagnosed with cancer. Shortly before he lost his 3-year battle with cancer, he wrote a story about a great knight who sought out the four diamonds of Courage, Wisdom, Honesty, and Strength in order to be released from the grips of an evil sorceress. These diamonds symbolized the attributes that Chris believed were necessary to overcome cancer. In honor of their son, Chris’ parents, Charles and Irma Millard, founded Four Diamonds to assist children and their families in their fight against childhood cancer. Crooners is AMT’s 2016 Original Show that celebrates the most popular and enduring songs from the 1920s through the 1950s, along with recent hits from today’s modern, soulful musicians. Many of the “Crooners” featured in the show were known for their charitable giving and supported numerous philanthropic causes, with cancer research and childhood issues among them. American Music Theatre is honored to continue the “Crooners” tradition as we join Four Diamonds in the fight against childhood cancer. The Four Diamonds mission is to conquer childhood cancer by assisting children treated at Penn State Hershey Children’s Hospital and their families through superior care, comprehensive support, and innovative research. 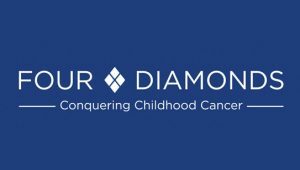 Each year, Four Diamonds provides direct support to approximately 600 children with cancer – 100 who are newly diagnosed and 500 who are continuing their fight. Since its creation in 1972, Four Diamonds has helped more than 3,600 children and families and supported a diverse platform of childhood cancer research at Penn State Hershey Children’s Hospital, seeking improved treatments and cures to benefit those around the world. Please consider helping our “Crooners Conquer Childhood Cancer” efforts with your donation to Four Diamonds today. Monetary donations can be made in person at designated collection boxes at the AMT Box Office and Concession stand areas, or online by clicking here. In addition, AMT will be selling wristbands and necklaces in our Gift Shop with 100% of the proceeds going to Four Diamonds. To learn more about Four Diamonds and the services they provide, click here.